CLOSEOUT! Significantly reduced price! These boots are sold by the pair. An alternative to metal shoes. 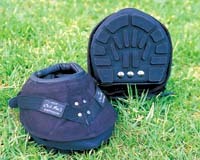 Old Mac's are shock absorbing and allow for the natural expansion and contraction of the hoof. Old Mac’s will eliminate brittle hoof walls and the stress and trauma caused to your horse through constant nailing. Old Mac’s will allow the hoof to regain it’s natural healthy state. Old Mac’s are very suitable for rehabilitation, transportation, and breeding applications. Designed to be used when riding and removed when horse is pastured or stalled.